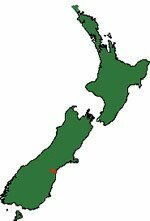 The Opihi is a small river flowing south-east with a length of some 75kms. It flows into the sea about 10kms north of Timaru. There is a small bach settlement near the mouth called Milford Huts on the edge of the lagoon. The Opihi River suffers from low flows and can all but dry up in mid-summer. There are reasonable numbers of smallish brown trout throughout the river. Mostly the river mouth is closed to the sea but can open for a time following rain. At such times the mouth and surf can fire up with quite a few salmon being caught late in the season. Jason with his second salmon this season from the Opihi River January 2008. Although today the Opihi often dries up in its middle reaches it was once a premier trout and salmon fishing river. 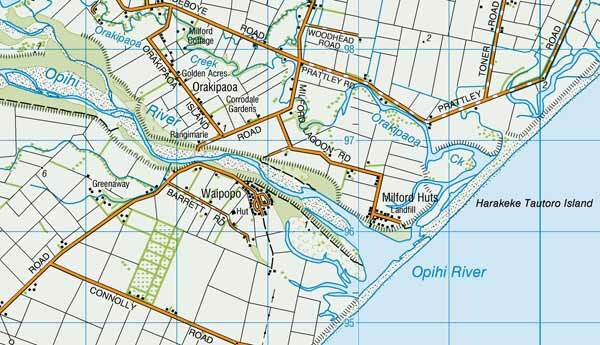 Thirty years ago the Opihi could on occasion yield more salmon to the anglers’ rod than the nearby Rangitata River. It is hard to believe that when you see the Opihi today. Although the mouth can be open for a time in early spring it soon closes off. During a dry summer, the middle and lower reaches almost disappear dropping to little more than a creek! Such has been the effect of taking water for irrigation! The Opihi River and its tributaries, Opua, Te Moana, Tengawai and Waihi were once among the most famous trout fisheries in the world. There is still good dry fly fishing to be had in these areas but the flies must be small and the presentation excellent. Steve’s Fishing, Hunting & Adventure Tours – Omihi, Temuka, South Canterbury. The salmon fishing on occasion is still good in the surf. Most angling activity is around the lagoon. Whitebaiting is also popular here in season. Salmon runs in the Opihi River, as shown in a report, published by Fish and Game, make interesting reading. It shows the salmon run in the Opihi River can in some years almost rival that of the nearby Rangitata River. Jason Lloyd with a real beauty from the Opihi River.